Winter is always that time of the year when a landscape photographer gets bored. Trees have lost their leaves, the days are excruciatingly short and all in all, it's just not the ideal time of the year for outdoor photography. Nevertheless, snow and frost show up sporadically and when this happens, landscape photographers have to seize that moment and head out. Because snow sometimes disappears just as fast as it appeared, especially in the Grand-Duchy of Luxembourg. For the past several years we were not very lucky with snow in Luxembourg. It snowed once or twice in 2015 and 2016. I remember those days very well, because I was outside making pictures. You can read about those snow days in my Winter in Luxembourg blog post. 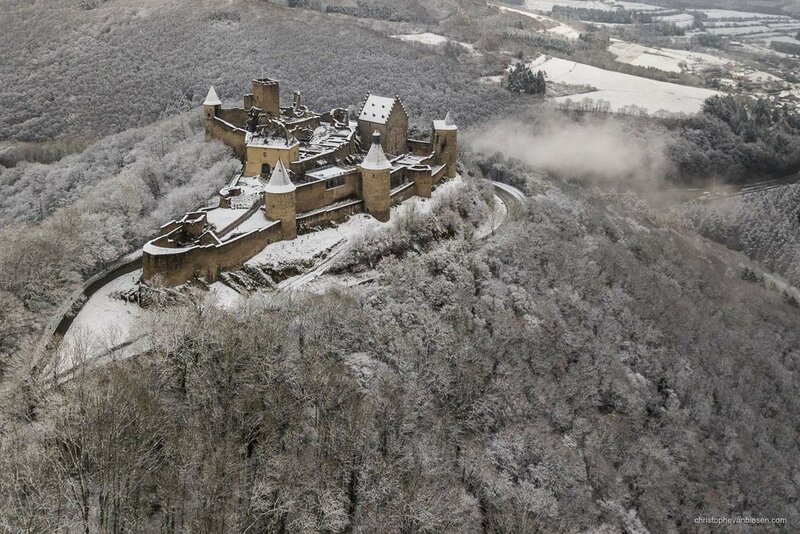 Back in January during that one single snow day, I drove out to the Beaufort castle and even made a short trip to the famous Vianden castle. I managed to capture some nice pictures back then. Unfortunately the snow disappeared too quickly and I did not have the time to visit one of my other favourite castles in Luxembourg. 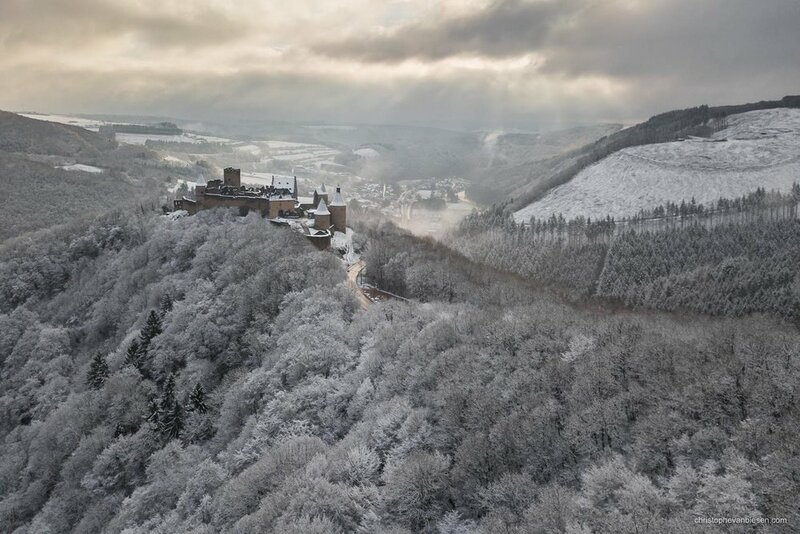 That is why I decided already back then that I would start my next snow at the Bourscheid castle. And that's what I did this time around. I just had to wait almost 12 months for the right conditions. Let me walk you through some of the best viewpoints on the castle of Bourscheid. The first spot I like to go to when coming to take pictures of Bourscheid Castle is right next to the camping on Rue du Château in Bourscheid. From there you get an incredible view on the castle. Some trees are however hindering you from making a decent shot right from the viewpoint, as it is often the case in Luxembourg. Although it is possible to climb on a small wall in order to make a picture without too many branches in the way. Just watch out not to slip with the ice and snow, since the drop would probably be quite painful. If you own a drone, this is a good spot to take off and get pictures of the castle from a higher vantage point. I took off with the Dji Mavic Pro to capture some aerial footage of the castle. In the end, the pictures made from the air on that morning are my favourites and probably also the most spectacular ones, since the sun decided to peak through the clouds right as I was flying around the castle and shed some beautiful light on the valley. The second location I like to visit is a viewpoint in Lipperscheid. This viewpoint might be further away from the castle, but the landscape draws some interesting lines and there is a road leading up to the castle which works very well in a vertical composition. The third and last viewpoint on the castle of Bourscheid lies along the road 348. This is the furthest view from the castle, but it also allows to capture the castle with the forest in the background. You should bring a telephoto lens for this location. Want to photograph Bourscheid Castle yourself? Let me guide you to my favourite spots during a 1-to-1 photography workshop.